It’s been a while since we looked at a Powerline, so here’s the TP-LINK TL-PA8010P KIT AV1200 Powerline Adapter. Priced well under $100, it’s another TP-Link adapter that’s relatively easy on the wallet. It’s theoretically capable of up to 1.2Gbps throughput, using HomePlug AV2 technology. Don’t expect to actually get these kinds of speeds, as similar to wifi, there are sources of interference and impedance to think about. Aging wires, interference over the wires are just two of the main culprits. Enjoy speeds up to 1,200Mbps (theoretical) over your electric wiring. Using MIMO & Beamforming, the TL-PA8010P KIT is capable of super-fast data speeds. This is great for HD streaming and moving files around the home. Powerline adapters can also be better for streaming over smart TV’s or gaming online, compared to using wifi. This can be because of potentially more interference over the air, or because end devices are far away from the wireless router, meaning weak signals. By using all 3 electric wire pairs, the TL-PA8010P can send data via two independent data streams at the same time. The two data streams are sent on any two-pairs of the 3 sets of two-pairs wiring in most homes. This helps to improve coverage area, especially in large homes, where older Powerline adapters fell short. HomePlug AV2 technology uses Powerline Beamforming to help increase the performance of data throughput over the wire. It’s easy to get up-and-running. Just plug in and the adapters sync with each other automatically. To complement the fast HomePlug AV2 technology, TP-Link have added a Gigabit Ethernet port for you to plug your device into. You don’t lose power outlets. 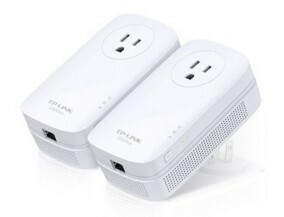 The TP-LINK TL-PA8010P plugs into the wall and has an outlet on the back so you can plug something else into it (up to 16A). There is a built in noise filter, to help block out potential interference from any appliance you do decide to plug in. If the Powerline adapters detect that they are not in use for a period of time, they go into power saving mode. Once data flows again, they automatically start up again in ‘working mode’.